With any canine below the age of 1, we highly recommend having them on a puppy or growth food. 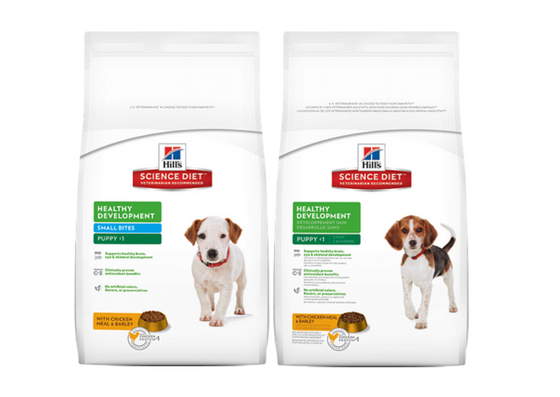 Hill's Science Diet Healthy Development provides a precisely balanced, easy to digest nutrition for your growing puppy! It provides natural DHA from the high quality fish oil, and it also provides optimal mineral levels, and Vitamins E & C help to keep a healthy immune system. 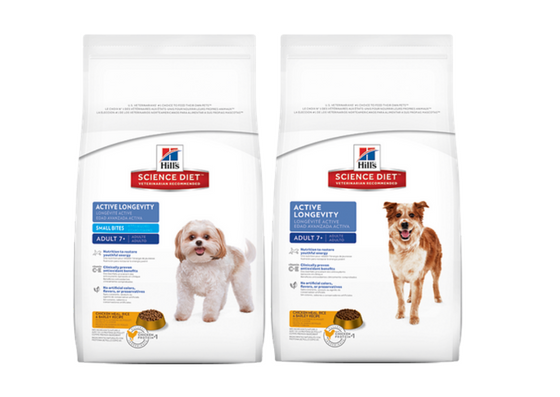 Hill's Science Diet Advanced Fitness is recommended for canines that are 1-6 years of age. It contains Omega- 6 fatty acids, Vitamin E, and other nutrients that nourish the skin and promote a shiny coat, while Vitmains E & C also help maintain a healthy immune system. The food has natural, high quality, and easy to digest ingredients with no artificial colors, flavors, or preservatives. 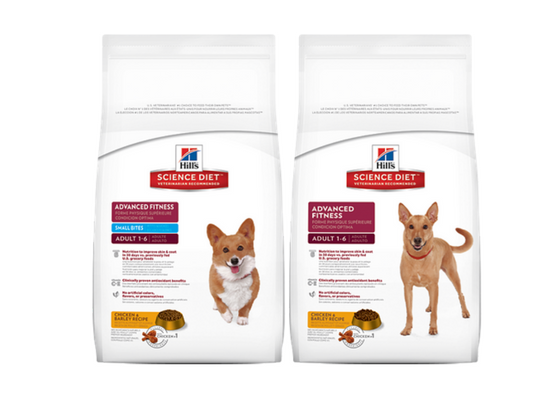 Real chicken is also used in Hill's Science Diet food to keep your pets muscles strong and lean. Once your pet is 7 years old they are considered a "Senior". At this point we recommend switching them to a senior food. With a synergistic combination of key ingredients, it will help with their "youthful vitality". Vitamins C & E promote a healthy immune system and it is easy to digest for your pet. Hill's Science Diet Healthy Development has natural DHA (high quality fish oil) that helps support healthy brain and eye development. Vitamins C & E help protect your kittens immune system between vaccinations. 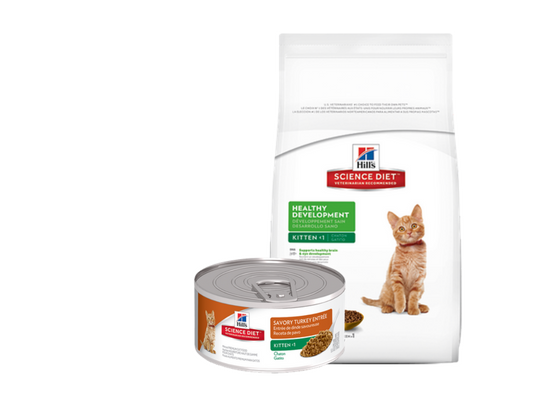 This food is easily digestible for your feline friend because it contains natural, high quality ingredients. We recommend maintenance food for any cat ages 1-6. 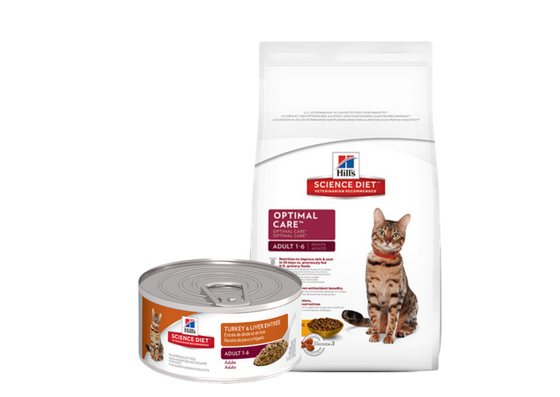 Hill's Science Diet Optimal Care contains Omega-6 fatty acids and other nutrients that help to nourish your cats skin and coat. Vitmains C & E help support your pets immune system, while natural, high quality ingredients make it easy for your pet to digest. Once your pet reaches 7 years old they are considered a "Senior". Our feline active longevity food helps reduce kidney stress in mature cats, along with helping your pets other organs. A healthy immune system is always important especially in your senior pet so the Vitamin C & E helps with that. 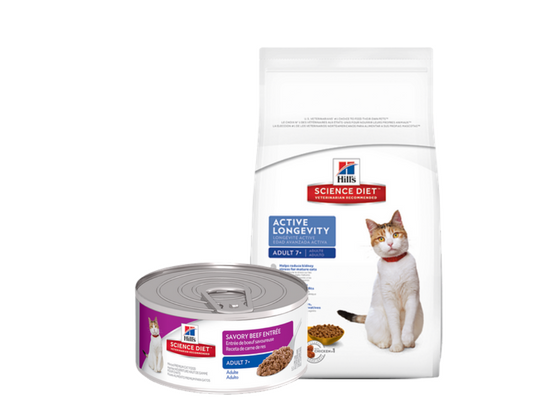 Feline Active Longevity is also easily digestible for your pet due to the natural, high quality ingredients. Click here to get coupons for your pets Prescription diet!